Especially created for Black/Afro American people Black Singles offers a safe and convenient place for meeting others online. It has and ample number of members, and it’s matching system lets just about everyone find someone with whom they are compatible. Sparks Networks run this site, which has been around a good few years now. The chat rooms and social areas are also a hub of activity. 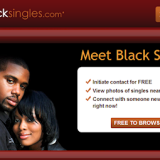 lackSingles.com is one of the most popular websites for African American singles. It has members throughout the US as well as other parts of the world. Whether you are looking for a date, or just new black friends to hang out with, the site won’t disappoint you. Although it is a dating site designed for black people to meet each other, it is not exclusive. 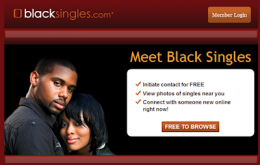 Though you don’t need to be black to join, the site attracts mostly black people looking for other black people to date or to meet someone who of that ethnicity. One of the good things it offers is larger profile photos than most dating websites. And, though it is a niche site, it offers a wide range of features. The site caters both to people who are interested in casual dating and those looking for long term relationships. You can join for free, which will allow you to browse and search for other members. Access to other features requires a paid membership. With over 160,000 members, this site is very active, and can certainly offer you a match. Many members report finding their true love on this site, and there are success stories from this site. The site is quick to load and easy to navigate. You are walked through the initial profile step by step.